Place sliced onions in the bottom of a Dutch oven or stock pot. Season the roast with salt and pepper, and place on top of the onions. Add the vinegar and bay leaf to the pan, and heat over high heat to get it simmering. Reduce heat to low, cover, and simmer for 3 to 4 hours. Try not to take the lid off while cooking. When the roast is done, remove it from the pan to a serving platter. Mix the flour into the water, and pour into the drippings from the roast. Simmer over medium heat, stirring frequently until thickened. 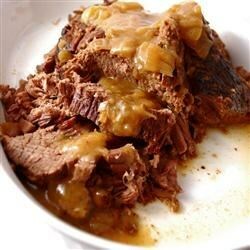 Carve roast, and serve with the pan gravy.